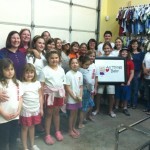 The volunteers at All Things Baby, Inc. are the heartbeat of the ministry! The work that is done here could not be done without their gracious efforts, but we ALWAYS need more volunteers. There are so many volunteer opportunities. We always need help in the warehouse cleaning, sorting, hanging and filling orders. We need people to help in the office talking and ministering to those we serve. We need those who would like to help solicit donations and send emails. We need volunteers to make blankets, provide food, cakes and decorations for showers, etc. We also need people who want to do whatever the LORD calls them to do for this ministry! If you would like to be a part of what the LORD is doing at All Things Baby, Inc. please look at the information below. For more information please use the contact form below or simply call Dawn at 405-620-4153. Choose the type of volunteering that works best for you! sending Thank You cards, making phone calls, etc. sale, or whatever other events we may have coming up. 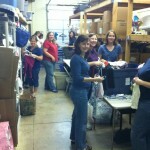 Here are some pictures of our volunteers.